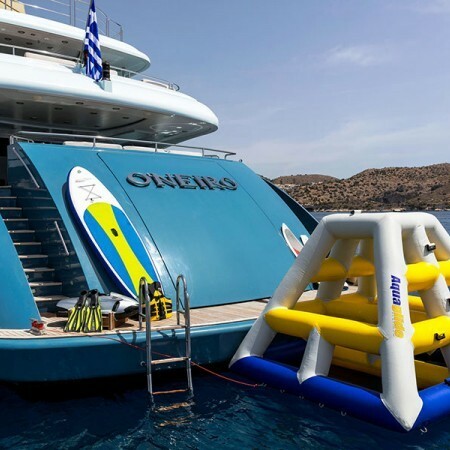 “O’NEIRO" – ( O-NEE-RO) ” meaning “Dream” in Greek, is exactly what this 52.7 meter yacht is! 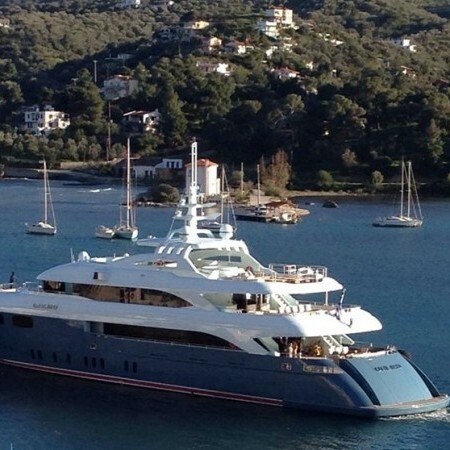 O’Neiro was built in 2008 by “Golden Yachts”. 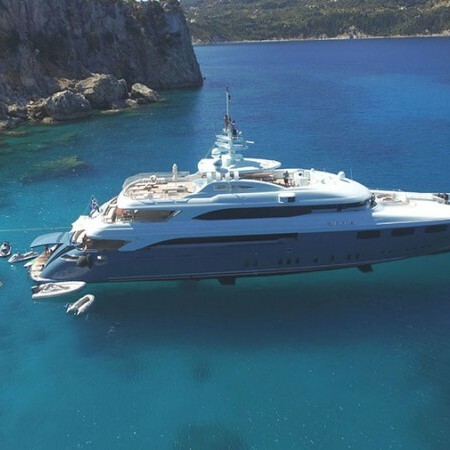 On board O’Neiro, you are situated on board her main aft deck facing the entrance into her salon and both to the left and right hand sides are staircases leading externally up to all decks. 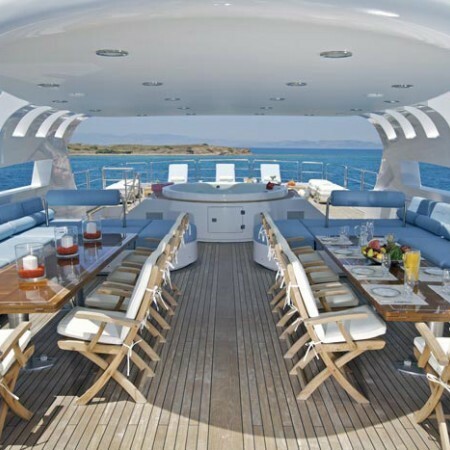 For your dining pleasure or just relaxing while cruising, there is a very nice wooden table comfortably seating twelve. 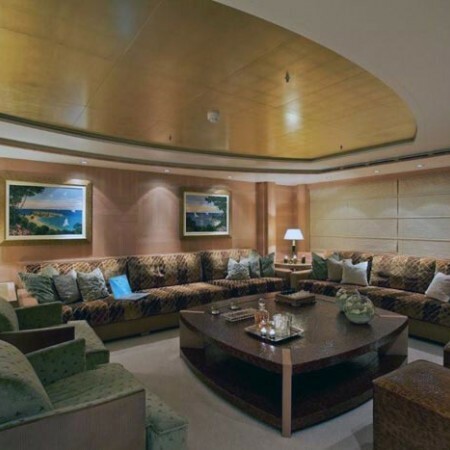 Her guests may be seated on very comfy cushion director chairs and couch. Once inside O’Neiro, the first area you are introduced to is her salon. This extravagant salon instantly captivates you, with her firm oak and maple floors and elegant rug accompanying her exquisite furniture all surrounded by zebrano wood and wonderful windows giving ample light. Directly in front of the entrance, you will find two extremely comfortable sofa arm chairs with high lamp tables on both sides for your comfort. Next to each of the lamp tables is a sofa couch seating six persons and a wooden coffee table with marble top in between. At the end of the salon, there are another two sofa arm chairs. For your viewing pleasure at the end of the salon and separating the dining area, is a forty two inch flat screen plasma TV which is discretely placed in a “fit-in” cabinet and appears with the touch of a button. Directly behind the salon is your lavishing dining area, featuring the well known interior design of “STUDIO GIORGIO VAFIADIS”. 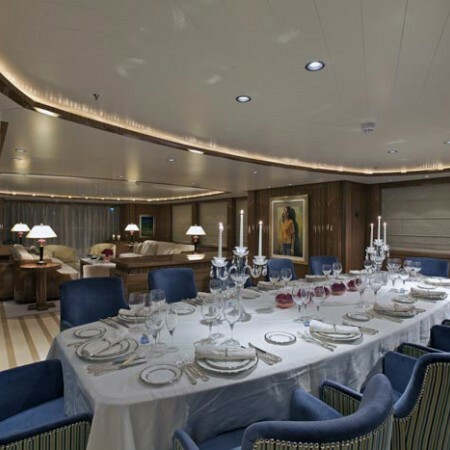 The dining area seats twelve guests who will savor the delicious gourmet dishes prepared by their distinguished Chef and served by their elite crew. To the left of the dining area is the entrance to the kitchen, at the right of the dining area is the entrance to the Master cabin. 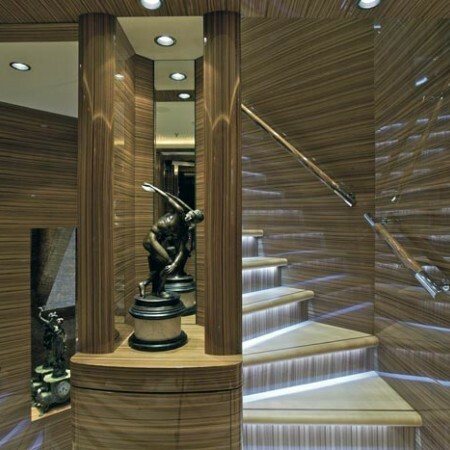 Prior to entering the Master cabin, on your left hand side is a stair-case leading down to the rest of the cabins. 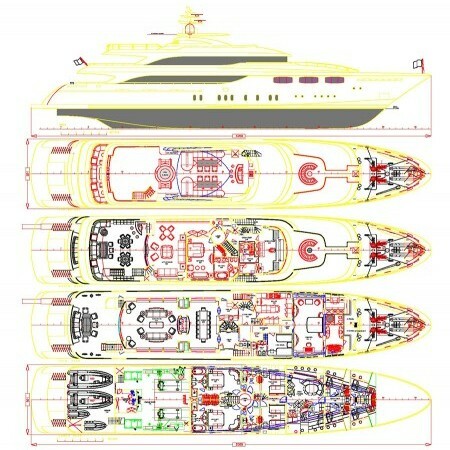 On your right hand side, you will find a door allowing embarkation and disembarkation of passenger from her starboard side. Immediately after walking past this door, you will find a day head to assist guests. After the day head, you will come the first of your three twin cabins and across is the stair-case leading up to the VIP cabin, Salon and Bridge and Twin cabins with Pullman berth, en-suite facilities with one water basin and shower, Satellite TV, DVD, CD and Stereo System, Air-conditioning and heating. 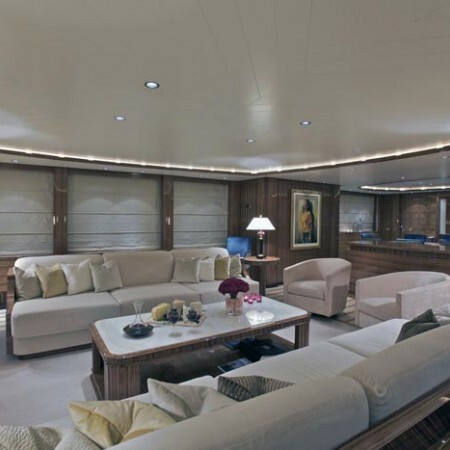 The third Twin cabin is identical to the other two Twin cabins and is located on the main deck prior to the Master cabin. Entering the Master Cabin the first area you come in contact with is a small hall-room. 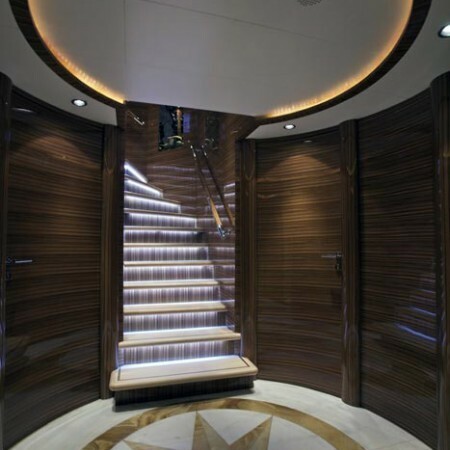 In order to enter the cabin, you may either slide open the door which separates the hall from the cabin or leave the door open and have the hall as one with the cabin. 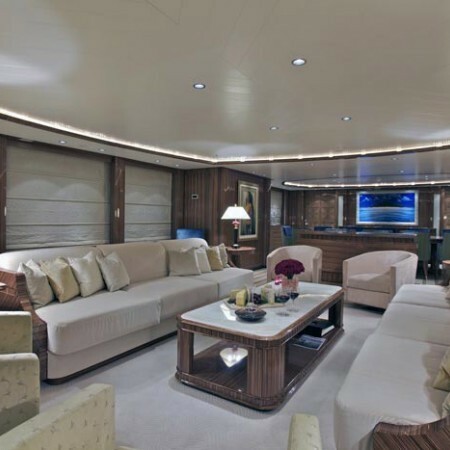 Once inside the cabin, to your left is the Plasma Satellite TV and extremely cozy couch. 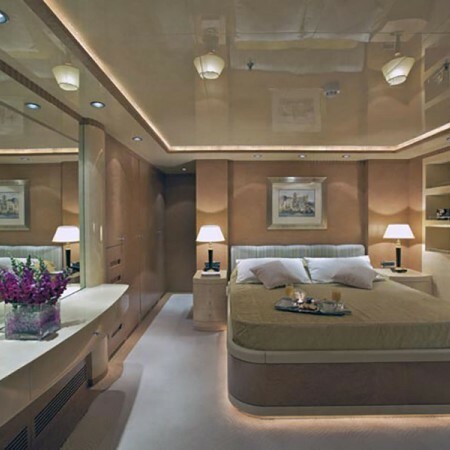 At the right of the cabin is desk which may also turns into a vanity. 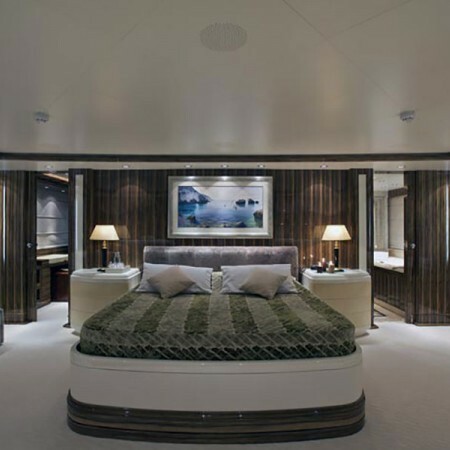 To the right of the cabin is the majestic en-suite bathroom with two water basins, Mosaique mirrors, Jacuzzi, showers with water from the top and side (manually). At the back of, there is an elegant bench with mirror (Frake). 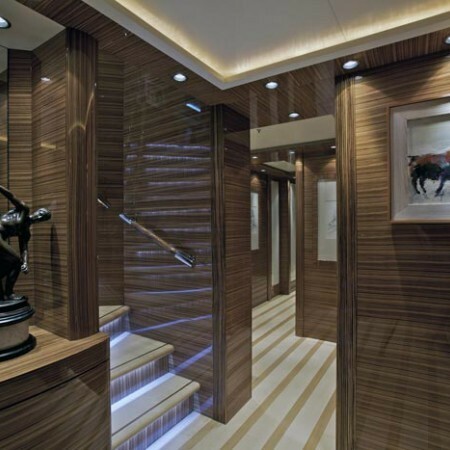 Now to the left of the cabin, you will find the very spacious walk in closet which has ample space for your wardrobe, petit vanity and safe box. 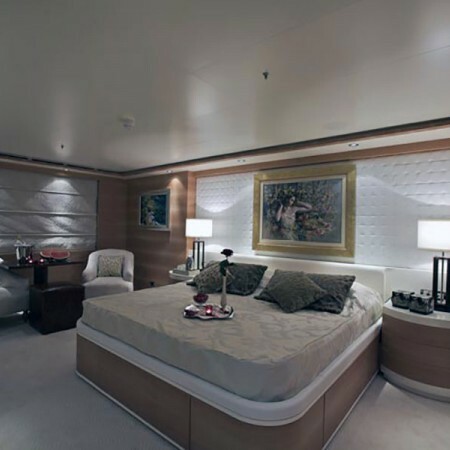 In the center of the cabin is the king size bed with night lamps and tables to both its sides. 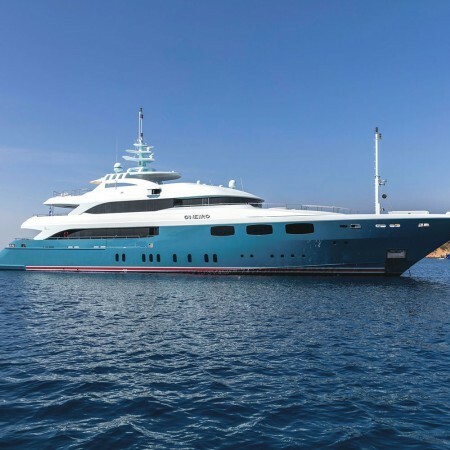 For further comfort, you will Satellite TV, DVD, CD, stereo system, air-condition, heating system and lights which may be turned on and off manually from the light switch at the entrance of the cabin or from remote control. 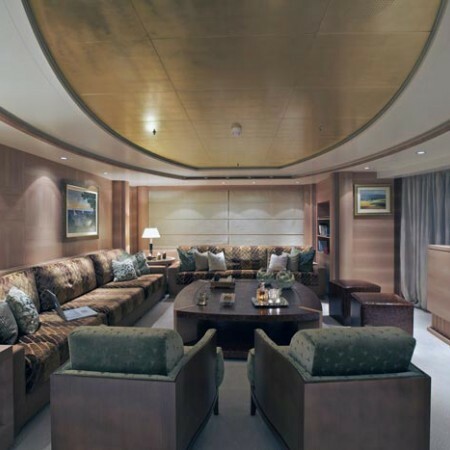 Your VIP cabin is located on the upper deck, enabling you to enjoy the captivating view in privacy, since the VIP cabin has direct access to the upper deck. 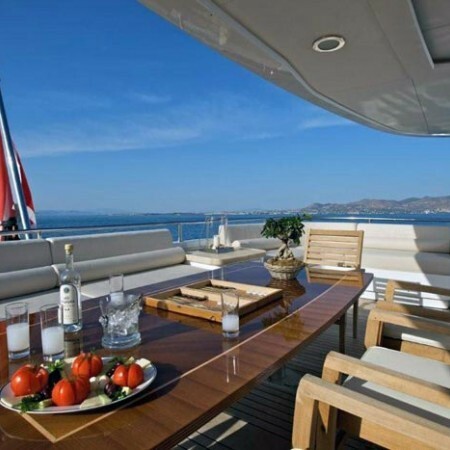 Here you may enjoy a nice drink from her bar, al fresco meal or just take a small time out. 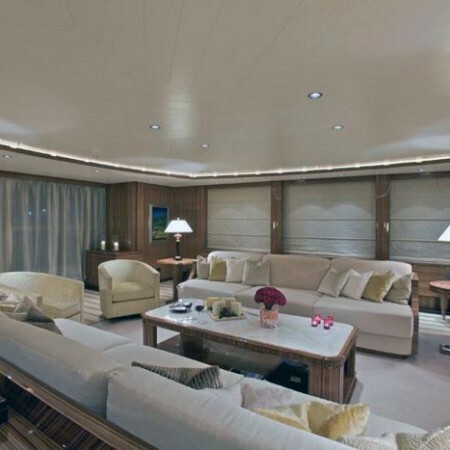 The entire cabin area is decorated with wall to wall white embroidered carpet. 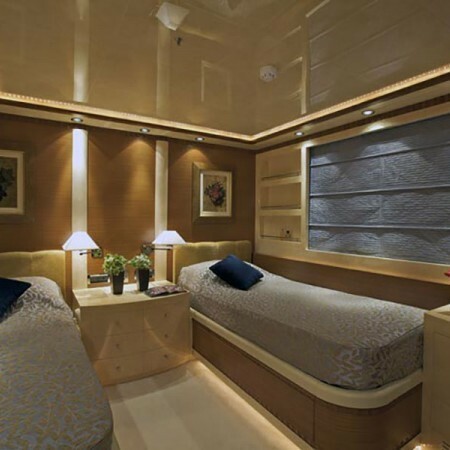 In the centre of the cabin is the very inviting king size bed, which has a small night tables at each side, for you to place your drink, book or anything else you may wish to keep near you. On top of the night tables, there is a reading lamp. 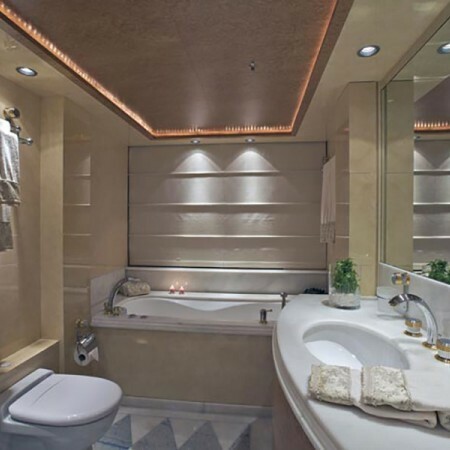 There is an en-suite bathroom with Jacuzzi, shower, mosaique mirros and two water basins. At the right of the cabin you have the walk in closet, which too is very spacious. In the subject closet you also have a safe-box. Also, at the left of the cabin, there are two sofa chairs and table. Satellite TV, DVD, CD, stereo system, air-condition, heating system and lights which may be turned on and off manually from the light switch at the entrance of the cabin or from remote control, are also at your service. Furthermore, all cabins have voltage of either 120 or 220, but there are adaptors to convert to 110. Exiting the cabin and taking a few steps down the hall, to your right you come to the salon. This area is very relaxing, peaceful, and ideal for you to spend time by yourself admiring the view or with company. Here you will find a Satellite TV, DVD, CD and Stereo System, which you may enjoy from either of the two six seat couches, or any of the two snug sofa chairs. In the middle is a fair sized coffee table and at both sides of the first couch, again coffee tables with lamps. 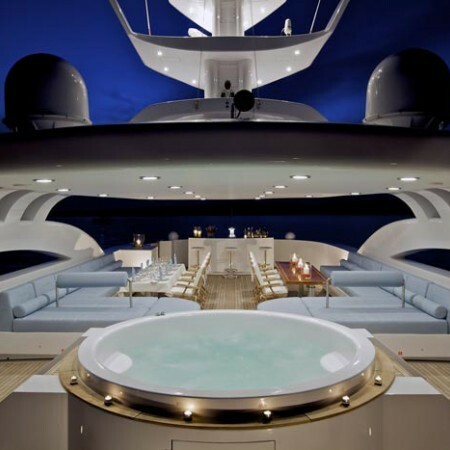 The Bridge of O’Neiro is located at the fore of the upper deck, in back of the VIP cabin and Salon. 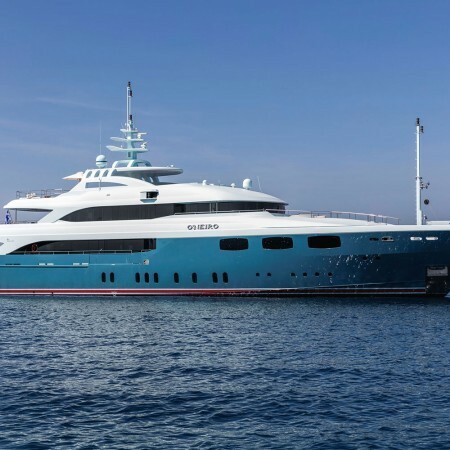 Fitted with state of the art technology and equipment, there is also wireless internet to accommodate her guests on board accordingly. 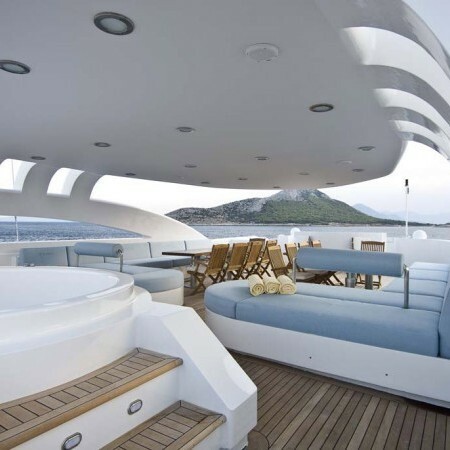 Directly out side and in front of the bridge, there is a small sitting area with a half moon couch and table, enabling guests to enjoy their cruising from the fore area. 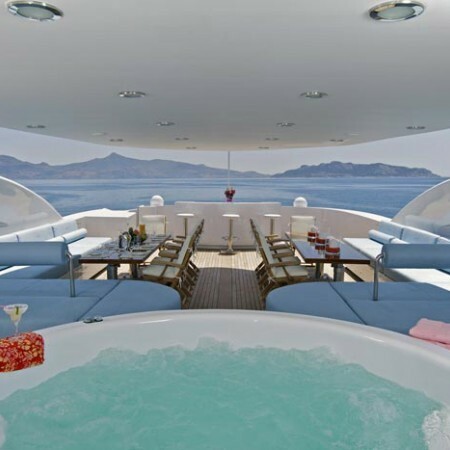 Now, should you wish to take in the rays of the sun, you may proceed to the sun deck where you will find a Jacuzzi waiting for you! There is also a bar, mini fridge from where you may get your drinks, without having to go inside and down the stairs. In front of the Jacuzzi at both sides, there are sunbathing mattresses for you to take in the rays of the sun. If you do not wish to lay down, you may enjoy yourself from the three very comfortable sun chairs and four small tables to assist you with your personal belongings. 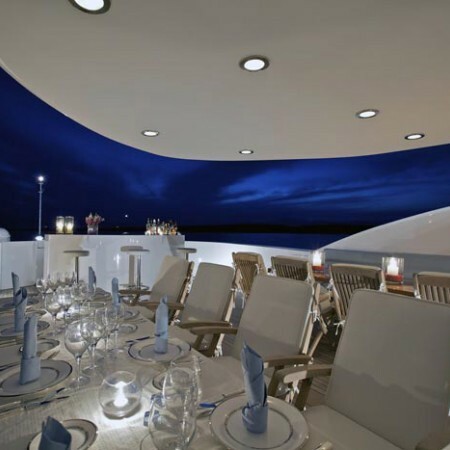 The sun deck has plenty of space, it is 130 square meters and another thing you may enjoy while up there is a bbq meal. 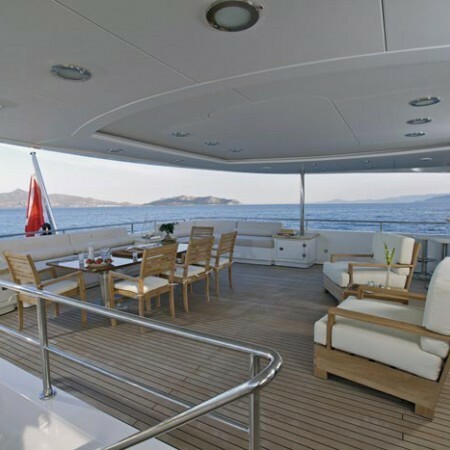 Your two Double cabins and two Twin cabins are located on the lower deck, by climbing down a few stairs from the salon or main deck. 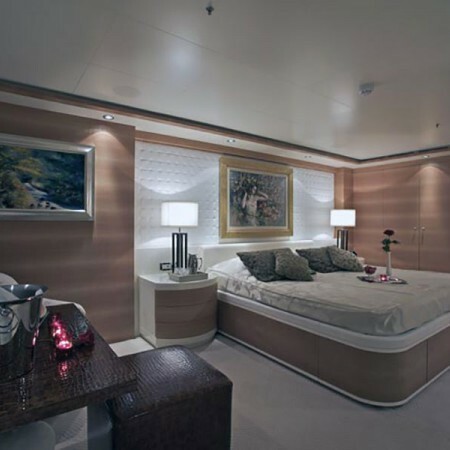 Both Double cabins have a very comfortable double bed in the centre with a two drawer night table at each side. Directly above the night tables, are two reading lambs. 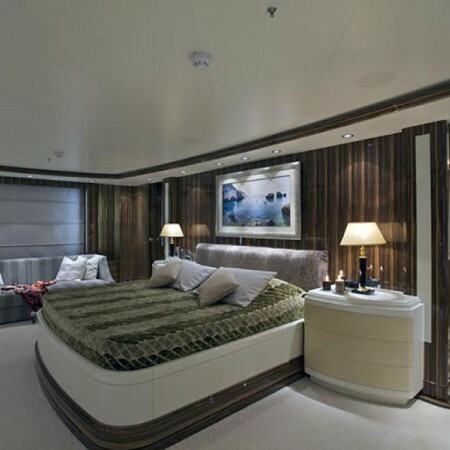 Both cabins have walk in closets and drawers providing plenty of room for your personal belongings and ward-robe. 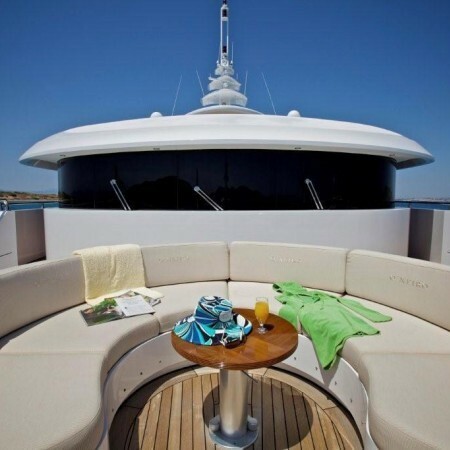 A half moon couch is also located in the cabin for further relaxation. 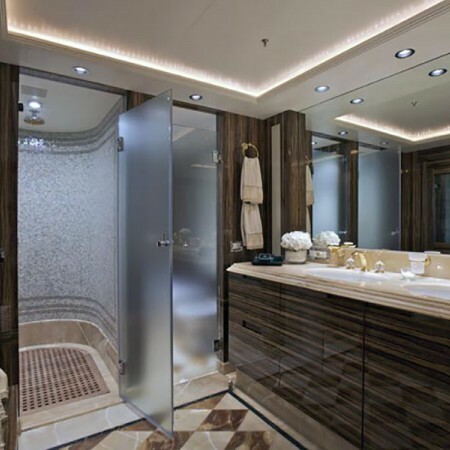 The en-suite bathroom has Jacuzzi, shower and two water basins. 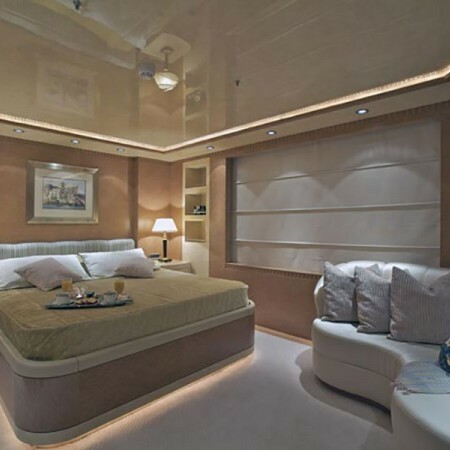 Also in the Double cabins you will find, Satellite TV, DVD, CD, stereo system, air-condition, heating system and lights which may be turned on and off manually from the light switch at the entrance of the cabin or from remote control. 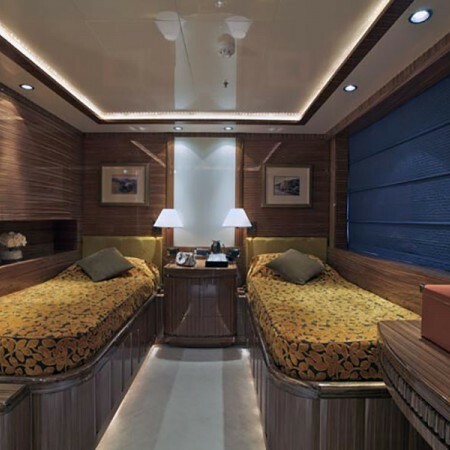 The two Twin cabins are equally exquisite, but feature lighter tones of wood and fabrics. This was taken into consideration for the younger parties who are to be on board. Between the two single beds, there is a three level drawer and reading lamp directly above. Further to the closet, there are drawers providing space for personal belongings and ward-robe. En-suite bathroom consists of shower and one water basins. Satellite TV, DVD, CD, Stereo System, air-condition and heating system are included. Both twin cabins have Pullman berths and connect with the double cabins (one twin with one double). 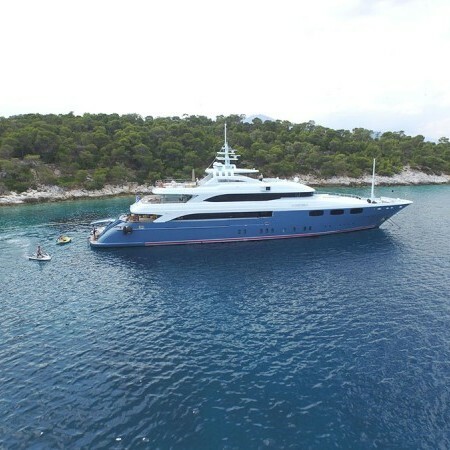 It was taken into consideration that it would be nice for the families to have the option of converting their cabins to connecting with that of their children, should they wish to do so. 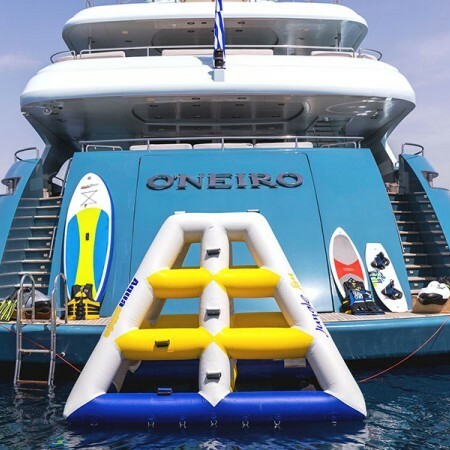 On board “O’Neiro” and your highly professional and skilled crew of eleven, your experience is surely one to be treasured! Tenders + toys: One Scanner 5,20m with 100hp outboard Yamaha 4-stoke engine, one tender Searay 195 6.15m with 220hp inboard engine Mercruiser diesel , one Yamaha waverunner three-seater 4-stroke FX Cruiser high-output, one Yamaha waverunner three-seater VX1800, two F5 Seabobs, stand up paddle board, water skis equipment, tubes, kneeboard, wakeboard equipment, fishing-trawling equipment, snorkeling equipment, water sofa for 4 persons (4 fun), inflatable Jungle Jim. One bicycle. Scuba Diving equipment (certified guests only). Rendezvous diving only. Various kgs of dumbbells, two ABS balls, jumping robe, gymnastic mattress.